I was nominated for the Sunshine Award by two amazing people. I don't normally blog, but how could I resist the challenge given by Elaine Witt? And who could even imagine turning down L.M. Bryski? I'm pretty sure both those things are impossible, and I wish to try neither of them so here are my answers to their loverly questions. Wait. I think there are rules I'm supposed to post. Yes! Let me start with those! Answer the eleven questions from the blogger who nominated you. Nominate up to eleven wonderful bloggers and write eleven (possibly fiendish) questions for them to answer. If you could cast the starring role in a movie loosely based on your life (only with dragons and pirates), who would you choose? No, I don't think I look like her, but she plays an outstanding nut job, and I fancy myself a bit loopy. And don't you think she could totally slay/train/best all the dragons ever?? Is the pen or sword mightier? Why? Well, I don't think I could even hold a sword (I hear they're quite heavy). How mighty would I be with a weapon I can't even lift? Not so mighty. But I can lift a TON of pens all at one time. And I can also write about slaying all types of beasts when I have pens. I'm going with the pen on this one. You have to pick one food to eat, every day at every meal, for the rest of your life: what is it? 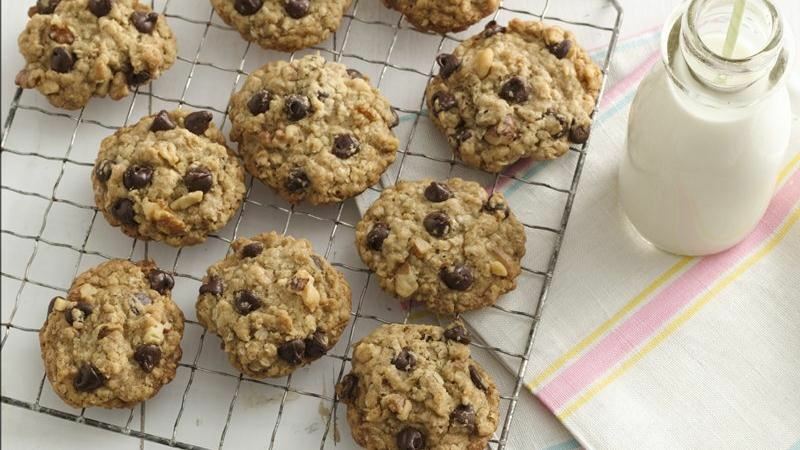 An Oatmeal Chocolate Chip Cookies every day at every meal for the rest of my life?? Heck yes! If I could just figure out how to make that happen without having to buy larger pants all the time, I would totally do it! You can relive one moment in time: when and why? Why? Because New York Times Bestseller List!!!! What book have you re-read the most? I don't re-read very often because I'm trying to read as many new books as I can. I guess if I have to pick one, it would be Green Eggs and Ham. I definitely read that one a lot. Wait, is this meant to be a novel I've re-read? If that's the case (and we're not counting any of my or my friends' manuscripts) then I'll have to say A Handmaid's Tale by Margaret Atwood. I love a good dystopia. What never fails to bring a smile to your face? There's nothing quite like a good "Nailed It" disaster. Have you ever heard a song so sad or beautiful it made you cry? Please share. This one is the most obvious answer. But if I give it a bit more thought, I guess I'd say Belispeak by Purity Ring is one of my favorites. There's something beautifully twisted about both the music and lyrics. It's magic and nonsense in a way that I love. Captain Jack Sparrow, Captain Hook, or Blue Beard? I don't really know much about Blue Beard. (Don't hate me, please!) Something weird happened to Johnny Depp after his, first Jack Sparrow movie. It was like he got stuck in this horrid character that was only mildly funny and not so endearing, and now he cannot play anything else. He really jumped the shark of his career IMHO. So, definitely not Sparrow. Captain HOOK, it is! I love Peter Pan. It's one of my childhood faves! Are you a truth, or a dare kind of person? Explain. 100% DARE!!!! I tell the truth all the time, and I'm not really ashamed of anything I've done, so the truth is kinda boring for me. I always love a good dare though. I love pushing boundaries!! Do all the things and eat all the chocolate! Wait. There's no eleventh question. What's the eleventh question???? Oookay, the formatting on this post has gotten all wonky, so I think I'll publish this Sunshine Thing now and post my second one separately. E. N. Publications is a participant in the Amazon Services LLC Associates Program, an affiliate advertising program designed to provide a means for sites to earn advertising fees by advertising and linking to Amazon.com. © 2019, Eliza Nolan. Simple theme. Powered by Blogger.